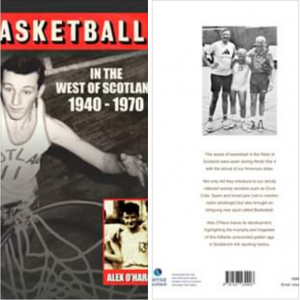 A new book “BASKETBALL in the West of Scotland 1940-1970” has been published by Alex O’hara. It explains how our great sport got started and goes on to give a season by season account of the clubs, players and characters over three decades, utilising extensive archive research to highlight the triumphs, tragedies and scandals which rocked the sport during those golden years of West basketball. As well as a wealth of detail concerning West leagues and cups, every Scottish Cup Final result is tabled together with a comprehensive listing of West District clubs and the names of players honoured at District and National level. Nevertheless the book is also a lively read with plenty of fascinating anecdotes to satisfy its readers. As the sole surviving original founding club, Glasgow University has its own chapter. All proceeds from sales will be donated to Sense Scotland Charity and the author will donate an additional £10 for every book sold. Sense Scotland will be launching my book at the Rocks vs Cheshire Phoenix match (Keiron’s penultimate home game) at Emirates Arena on Sunday 14th April at 5pm. I will be there before the game, accompanied by some Scotland and GB Auld Stars to sell and sign books, and to talk basketball.